Charles “Charlie” C. Bassett (1847-1896) – One of the many men who served the law in the wicked little town of Dodge City, Kansas, Bassett hailed from New Bedford, Massachusetts and fought with the Union Army during the Civil War. Mustered out at Fort Sill, Oklahoma, Bassett stayed out west, settling in Dodge City. On June 5, 1873, he became the Ford County Sheriff. 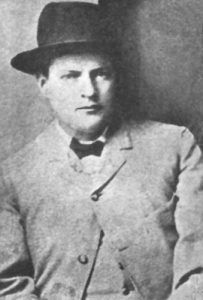 Working with Under-Sheriff, Bat Masterson, the pair pursued Sam Bass following his holdup of a Union Pacific train in Big Springs, Nebraska in 1877. Bassett served two consecutive terms as sheriff, but when a local ordinance prohibited him from running for a third term, Bat Masterson became the Sheriff, appointing Bassett as his under-sheriff. When Bat’s brother Ed, who was serving as Dodge City Marshal, was killed in April, 1878, Bassett replaced him. During the time he worked as marshal, both Wyatt and James Earp worked as deputies for him. Bassett was on hand for the Loving-Richardson Shootout in the Long Branch Saloon on April 5, 1870. After resigning as Dodge City’s marshal in November, 1879, he moved to New Mexico, where he worked as a guard for Adams Express Company. The next year he was mining for gold in Montana, before wandering about Colorado and Texas and making frequent trips back to Dodge City. Finally, he settled in Kansas City, were he worked in and owned a number of saloons. He returned to Dodge City in 1883 when Luke Short was in a dispute with city authorities and called in all his friends for support. Bassett died at Hot Springs, Kansas on January 5, 1896.